To date, mid-rise and high-rise buildings have typically been constructed from concrete and steel. But architect Michael Green says that we should use wood instead, because concrete and steel production contributes significantly to the world’s greenhouse gas emissions. Green believes that using responsibly harvested wood in lieu of concrete and steel may be the best option for reducing greenhouse gas emissions and storing carbon in buildings. In a recent TED talk Michael Green discussed his theories, and his firm’s study, The Case for Tall Wood Buildings, which proposes a building system that primarily uses wood to build mid-rise and high-rise buildings. Hit the jump to watch his TED talk! In the past, wood has not been used for mid-rise and high-rise structural applications for reasons of cost, safety and fire resistance. Concrete and steel offer the structural qualities required to construct these types of buildings at a much lower cost than wood. But Green and his team have come up with a cost-effective wood structural system called Finding the Forest Through the Trees (FFTT) that utilizes mass timber panels engineered for strength through lamination of multiple layers. According to Green, FFTT achieves a much lighter carbon footprint than the functionally equivalent concrete and steel systems, at a competitive price. FFTT is a primarily wood system with a solid wood central elevator and stair core and wood floor slabs. Steel beams in the perimeter provide ductility to address wind and earthquake forces and concrete is used below grade for the foundation. This wood-based system opens up the architectural possibilities because it allows for more flexible, open floor plans and thinner exterior walls. 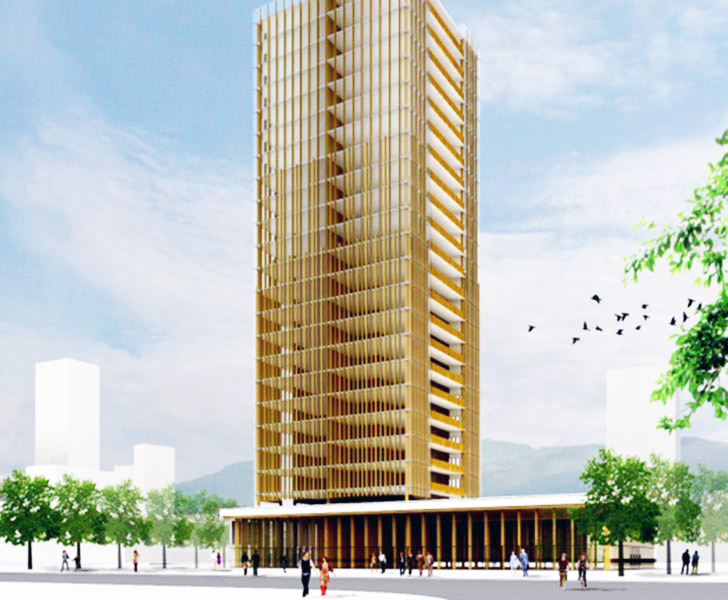 Green is planning to test out the FFTT system in a 30 story wooden tower he is developing in Vancouver. To date, mid-rise and high-rise buildings have typically been constructed from concrete and steel. But architect Michael Green says that we should use wood instead, because concrete and steel production contributes significantly to the world's greenhouse gas emissions. Green believes that using responsibly harvested wood in lieu of concrete and steel may be the best option for reducing greenhouse gas emissions and storing carbon in buildings. In a recent TED talk Michael Green discussed his theories, and his firm's study, The Case for Tall Wood Buildings, which proposes a building system that primarily uses wood to build mid-rise and high-rise buildings. Hit the jump to watch his TED talk!